Tricia came to us as a referral, and then met our team in person at the Seattle Home Show. 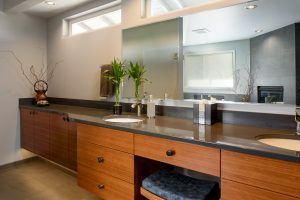 She was interested in remodeling her master bathroom to upgrade the aesthetics to something consistent with her current preferences. 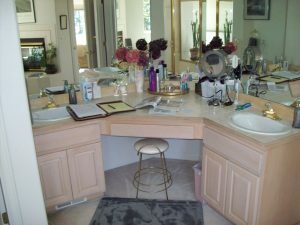 In addition, due to where her home’s water heater was located, it took a long time for hot water to reach her bathroom, something she definitely wanted fixed. She was tired of putting her feet on cold tile each morning, so heated flooring was important in her new space. 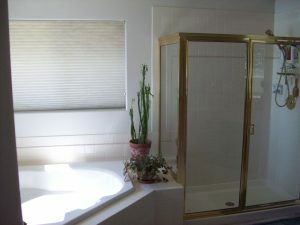 As she intended to age in her home, the design should include features that would be appropriate should her abilities change. 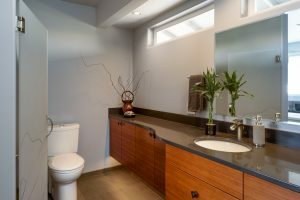 She desired details that were attractive, but functional, including grab bars, a seat in the shower and a toilet and shower design that could accommodate a wheelchair, should that be necessary. 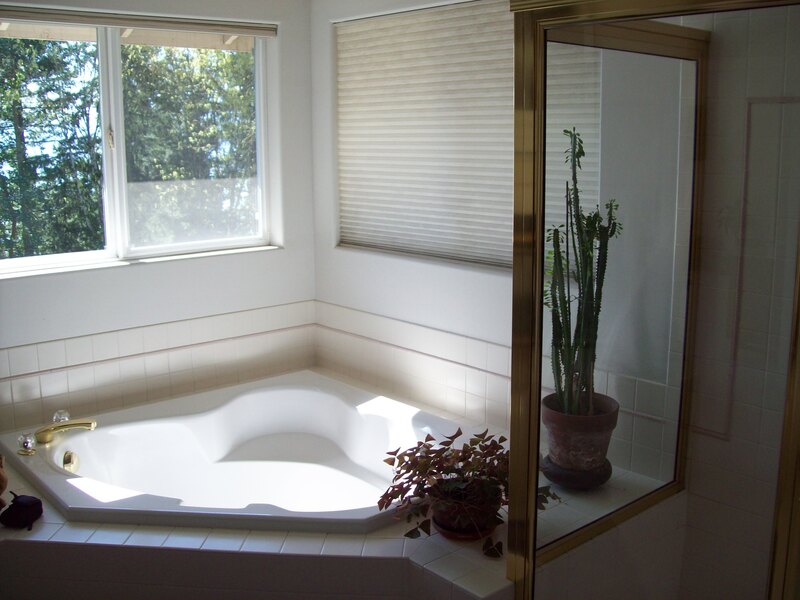 A Japanese soaking tub incorporated into the design was important to her, along with enhancing the general physical warmth of the space. 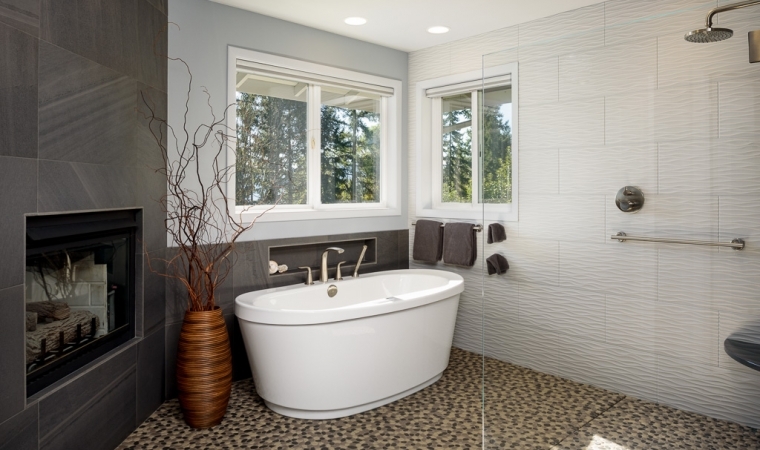 Lastly, she had a lovely view of Lake Sammamish that she still wanted to be able to appreciate from the privacy of her shower. Tricia worked with our design team to develop a design that depicted her wants and aesthetic preferences. Our designer utilized a favorite painting of Tricia’s, an Ansel Adams for inspiration, and color scheme. 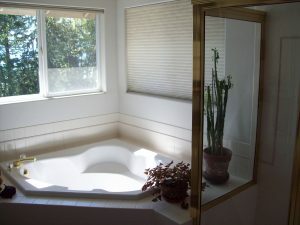 A deep freestanding tub was installed near the fireplace and would serve as her Japanese Soaking Tub. 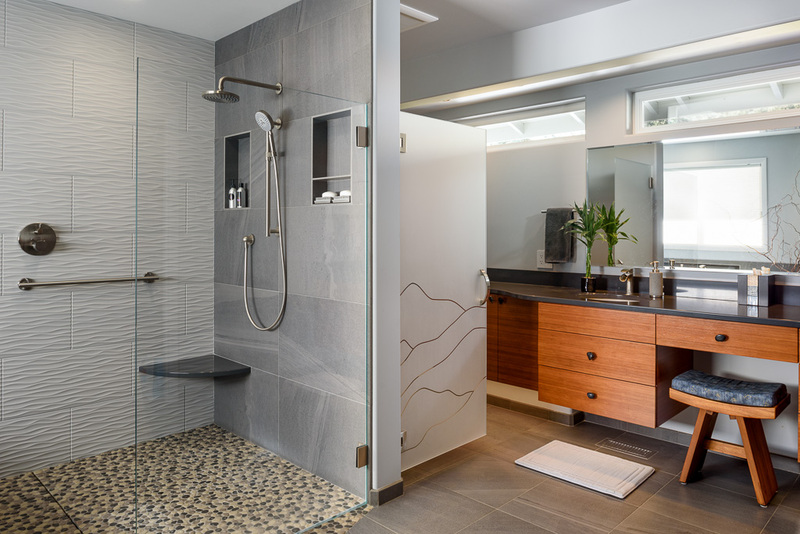 The design included the shower and tub to serve as an open wet room with a linear drain installed, leaving plenty of space for wheelchair accessibility, should it be needed. 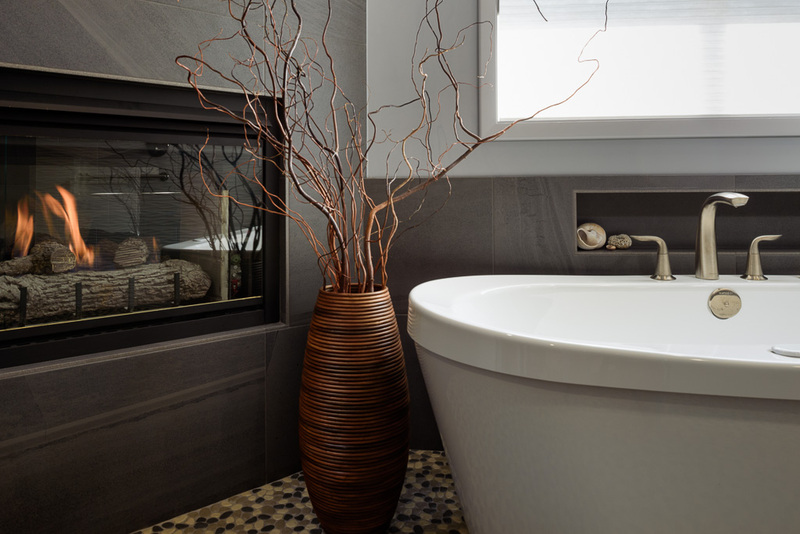 The existing double-sided fireplace facade was refaced on the bathroom side to include new beautiful porcelain tile from United Tile and the fireplace itself was painted black with heat-safe paint to give it new life. 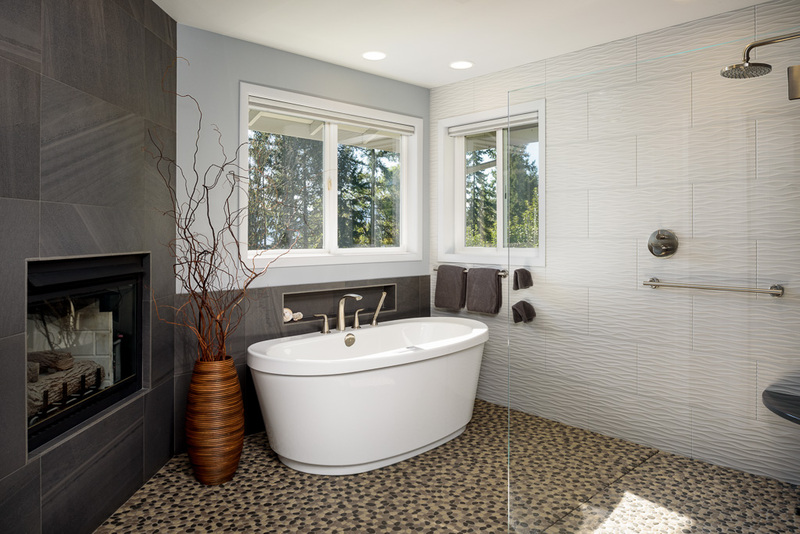 The same tile was used for the floor with a heat underlayment for most of the bathroom, including in the toilet area for added warmth. 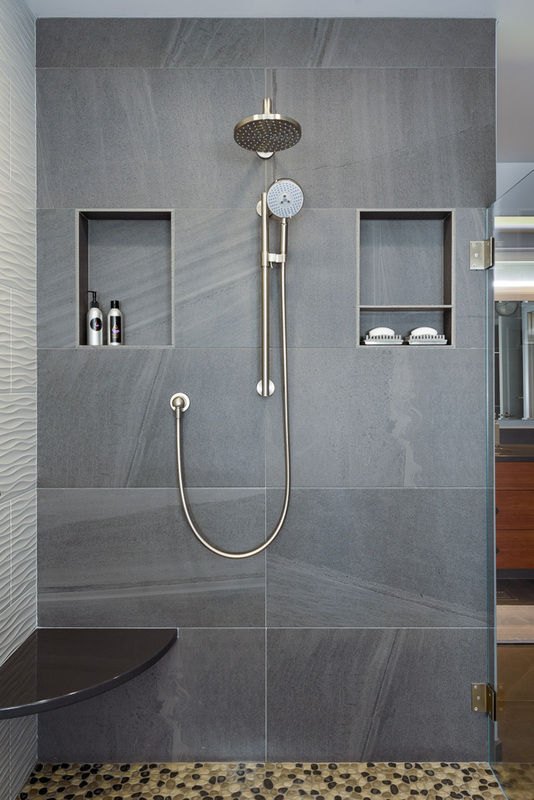 A Pental Grigio Wave accent wall graced the south side of the wet room, providing a lovely alternative to the gray. 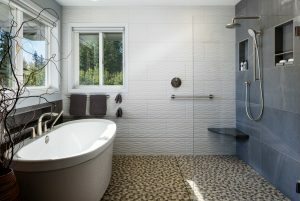 Tricia chose Bati Orient Flat Pebbles as the floor tile for both looks and tactile presentation. 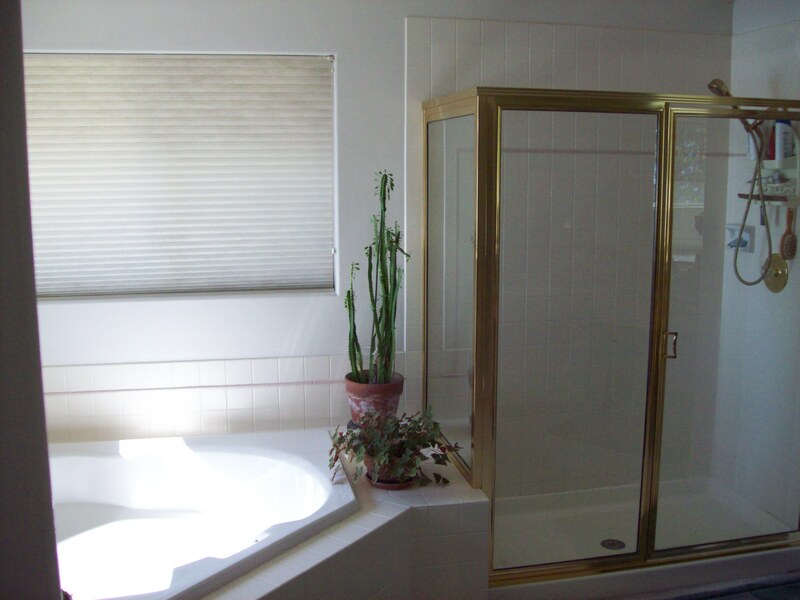 A unique element in Tricia’s bathroom, was the beautifully etched glass door that created privacy for the toilet area upon entrance to the room. The finished space is beautiful, clean and warm! 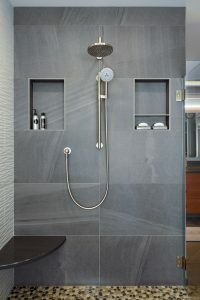 The rounded cut of the tile was replicated in the wave design of the countertop and in the shower wall tile, providing a consistent and elegant look. Tricia loves the modern, clean lines of her space.